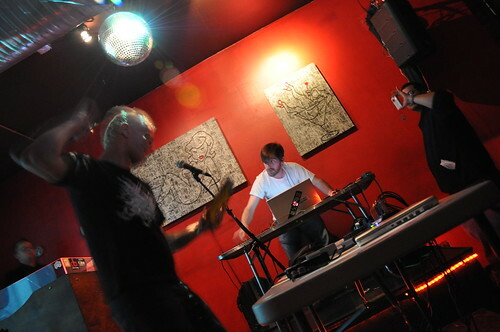 On March 10th I did live video projections for the final rounds of the Laptop Battle at the AMODA Digital Showcase at South by Southwest 2012. Many talented musicians and visualists performed and showed their work — check them out. Thanks to Chris Jordan and Anton Marini for loaning me their gear! Chris has built a number of multi-mirror reflectors (that you can see briefly at 01:05 in the video) that split the projection beam up into a rotating spray of smaller images. The result is gorgeous and I am very thankful I have such generous friends who’ll share the gear and expertise with me. Tomorrow evening I’ll be doing live visuals at the Open Planning Project, following a global webcast of Lawrence Lessig speaking live from Harvard Law School about fair use, online video, and politics. This event is free, so come on out for an interesting discussion and film screening, then stay for the free food and beer and awesome visuals and music by yours truly and DJ c-tor. Screenings of the chat are being held around the world, so if you’re not in New York but still want to check it out, visit the Open Video Alliance site to look for an event in your city. Of course, you’ll miss out on my visuals, but it looks like there’s lots of good stuff planned for every location. Subject: let’s turn this wintery mix into a winter remix! just a reminder that our new york screening event is tonight feb. 25th beginning promptly at 6pm with a lecture by lawrence lessig. it’s at the open planning project, 148 Lafayette b/w howard and greene, on the penthouse level so take the elevator all the way to the top. and of course, friends, colleagues, and members of the open video alliance. we’re now at 40 cities and 4 continents worldwide for tonight alone! tell your friends, tag the web with #wireside, and look forward to seeing you there. Happy New Year! Glomag and I have been invited to do a couple songs on the Engadget Show again this Saturday. If you would enjoy (or at least not utterly detest) the discussion of gadgets, gaming and technology by wisecracking bloggers, do come. It’s free (but you have to queue for tickets), their guest is Google’s senior product manager for Android, Erick Tseng, and they’ll be raffling off CES swag, too. Details below but please be sure to check the Engadget post for updates. Miss our first performance? Head to Engadget.com to watch Show 003. Go down to the video player and skip to 69 minutes in if you only want to see glomag and me play. Took me long enough…here’s the video. Video’s up! Head to Engadget.com to watch Show 003. Skip to 69:35 if you just want to see Glomag and me play. This Sunday glomag (excellent chipmusician, friend and producer/director of This Spartan Life) and I will be playing two songs at a live taping of the third episode of The Engadget Show. Tickets are free but you have to pick them up at the box office before the show (see details below). Hope you can come! Description: The Engadget Show, next Sunday, November 22nd, with Drew Bamford, director of HTC’s Innovation Center; Joystiq’s Editor-in-chief Chris Grant for a special roundtable discussion focused on gaming. Live music by glomag and live visuals by Dan Winckler. Filmed live in front of an audience at the Tishman Auditorium at Parsons The New School for Design, at 66 West 12th Street between 5th and 6th Avenue. Seating is limited and tickets will be handed out on a first-come, first-served basis — arrive early and be prepared for a little wait. Parsons students are welcomed, and we encourage them to come! Tickets will be available for pickup at the Tishman Auditorium at 2PM on the 22nd, and we’re strongly encouraging people to get their tickets and not stand in line — if you have a ticket, you’ll have a seat! You cannot pick up tickets for other people — if you want your friend to get a ticket, bring your friend!